Senpai will be mine. He doesn't have a choice. 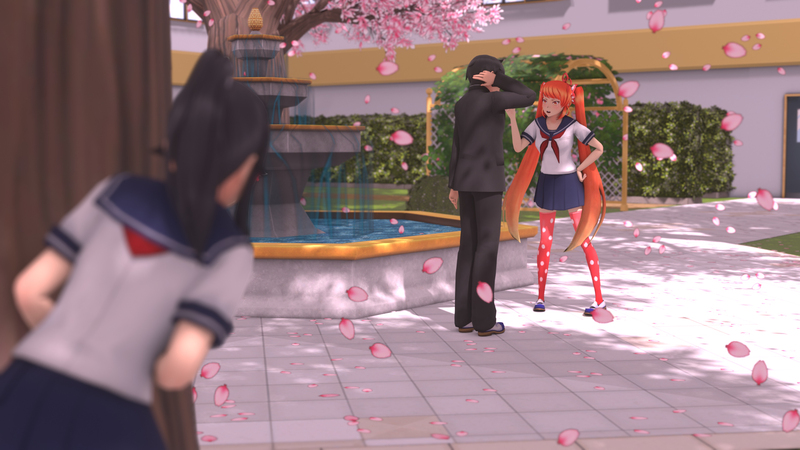 Don't let Senpai notice you! 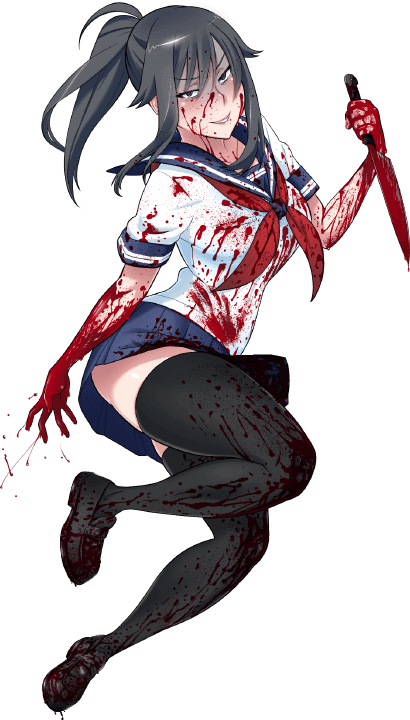 Yandere Simulator is a stealth game about stalking a boy and secretly eliminating any girl who has a crush on him, while maintaining the image of an innocent schoolgirl. This game is currently in development. Debug builds are available for testing purposes. You can't actually beat the game yet, but you can download it and test for bugs. 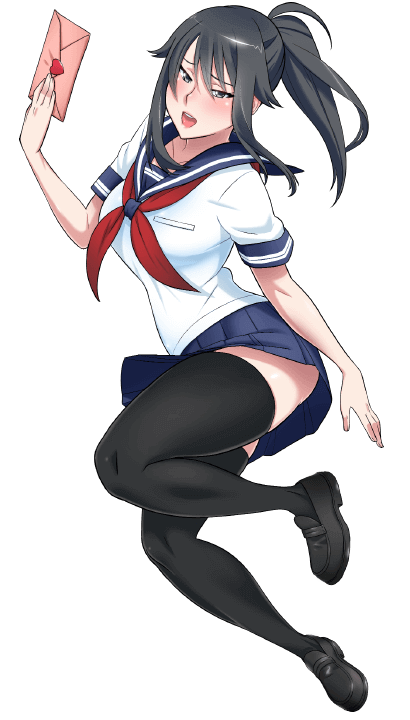 Every week, a new girl will fall in love with your Senpai - you must eliminate her before she can confess her love to him on Friday! A wide variety of options are on the table; you can set her up with another boy, ruin her reputation, get her expelled from school, frame her for a crime, sabotage her interactions with Senpai until he hates her, or kidnap her and keep her trapped in your basement. Or, if you prefer a more direct approach, you can simply kill her when nobody is looking! Everyone at school knows your name and face, and your actions will affect your reputation. In order to maintain the image of an innocent high school student, you'll have to be careful how you behave around others. You can also attend class, join clubs, and make friends to gain various advantages. Attending class will allow you to develop new abilities, joining clubs will provide you with club-specific items, and if you make friends, you can convince them to do various favors for you! When you commit murder, you'll have to clean up after yourself. 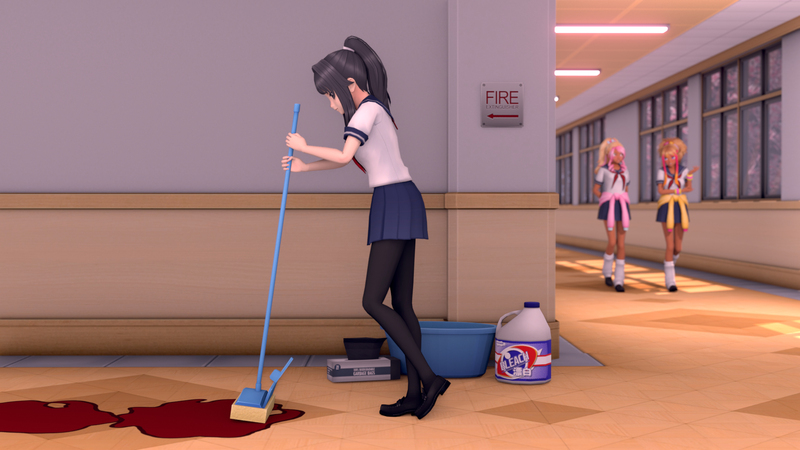 Use a mop and a bucket of water to wipe away all the bloodstains that you've left behind, dispose of any murder weapons that have your fingerprints on them, and incinerate corpses to cover up all evidence of your crimes! Watch out - some students will snap incriminating photos of you and report you to the police if they see you commit a murder...and other students are brave enough to chase you, disarm you, and apprehend you!